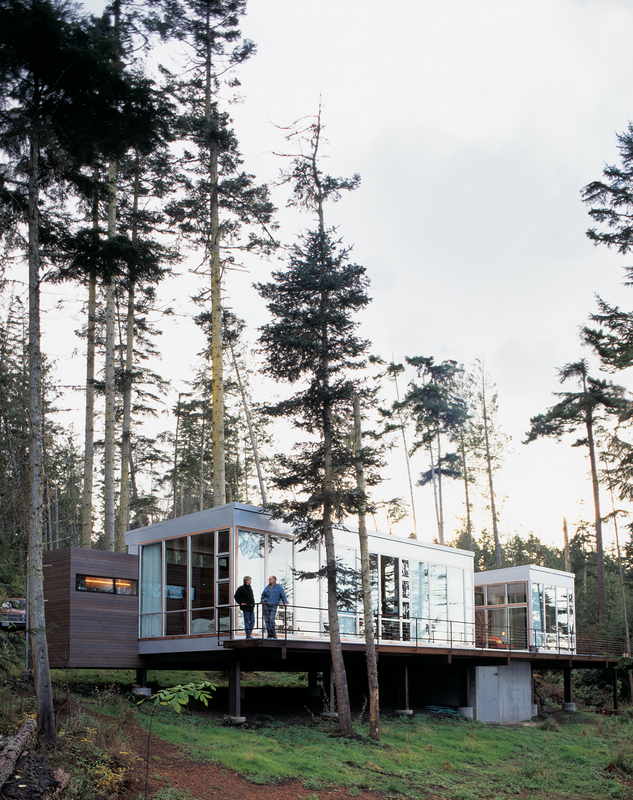 Blessed with an enviable site on the sylvan shores of the Strait of Juan de Fuca in Washington state, architect Anthony Pellecchia and his wife, graphic designer Kathy Wesselman, wanted to create a vacation house that would be tied as much to the natural environment as to an aesthetic tradition. The dramatic Strait of Juan de Fuca sets the stage for a Seattle couple's ideal getaway. Galvanized steel is used to bridge the gap between natural landscape and structure in the entryway of the house. The "stage" allows for optimal light and viewing conditions. The "bar" area houses all of the service sections like the kitchen, bathrooms, and laundry room. Blessed with an enviable site on the sylvan shores of the Strait of Juan de Fuca in Washington state, architect Anthony Pellecchia and his wife, graphic designer Kathy Wesselman, wanted to create a vacation house that would be tied as much to the natural environment as to an aesthetic tradition. Pellecchia, who worked with architect Louis Kahn from 1967 to 1972, looked to his former boss for inspiration. Lucy as a nod to both Pellecchia’s Italian heritage and his mother, Lucy, succeeds in enhancing the natural beauty of the land without overpowering it. After moving from Denver to Seattle in 1993, Pellecchia and Wesselman merged their firms to form WPa, a hybrid graphic design and architecture studio. “We had worked on an exhibition for the Denver Art Museum in such a way that there wouldn’t be a recognizable line between the architectural and the graphic disciplines, and that got us interested in working together,” Pellecchia explains. “There are some graphic components to Villa Lucy that obviously wouldn’t have existed before the merger. The big red door, for instance, is very much influenced by a graphic notion of design.” The galvanized grating bridge that leads up to this dramatic 6'8"-by-6'8" pivot door connects the house to the site but also maintains a sense of separation. “The site was the most important aspect of the project for us,” explains Wesselman. “We positioned the house to have a spectacular view of the water, but we didn’t take down all of the trees to achieve that.” This commitment to maintaining the integrity of the site and its surrounding ecosystem went as far as planning a building schedule around the mating season of a neighboring eagle couple, so as not to endanger the fledglings. In addition to leaving the landscape well enough alone, Pellecchia anchored the house on six prefabricated moment frames, raising a large portion of the structure to allow the natural slope to continue untouched beneath—an approach that reduces impact in two ways. “Off-site fabrication is appealing because we can minimize the amount of storage area that’s needed for equipment. It allows us to sequence the construction effectively, as the steel framings can be fabricated while we’re building the foundation.” The project’s heavy reliance on prefabricated steel presented a welcome challenge for Pellecchia’s son, Aran, who acted as the contractor on the project. The stage zone houses the sleeping and living/dining quarters and is furnished with lightweight pieces like Alvar Aalto chairs, a Monica Armani table, and a table of Pellecchia’s own design; both tables are set on casters to facilitate movement and interior flexibility. The bathrooms are accessible from the stage by way of seamlessly integrated sliding doors, which are virtually indistinguishable from the poplar siding that finishes the interior walls. Most important, the stage offers access to Villa Lucy’s breathtaking view—which is what it was designed to do. “It’s a clean, modern structure. But it really is a place for us to observe, so that we can perch ourselves and watch all the activity that happens on the site, the various animals, the wind, the rain,” says Wesselman. The result is a rooted structure that tiptoes across the site but makes a dramatic visual impression. “I’m not a camper,” balks Pellecchia. “We’re urban people, so our interest is enjoying and observing. We think of the large area with all the glass being the stage, and the performers are outside.” This is certainly a humble observation, but one cannot deny that the lens through which Pellecchia and Wesselman observe is equally as compelling and lovely.